The most up-to-date New Zealand research around the use of Chromebooks and GSuite for Education currently comes from the Manaiakalani Evaluation Program, which is one of the most comprehensive and well-funded research programs across a cluster of schools in New Zealand. The cluster involves 11 primary, intermediate and secondary schools in Auckland. The programme begun in 2007 and has developed into a significant body of research over the last 9 years. The principal Auckland University researchers are Dr. Rebecca Jesson, Professor Stuart McNaughton and Dr. Aaron Wilson. If you would like to read about their most current report, please click here. There are considerable, proven learning benefits to be gained from students having guided access to Chromebooks and Google Apps for Education. The graph below is from Tamaki College which is a decile 1 school in Auckland that is part of the Manaiakalani cluster. This school uses the Google platform with Chromebooks. These technologies were used from 2011 onwards. 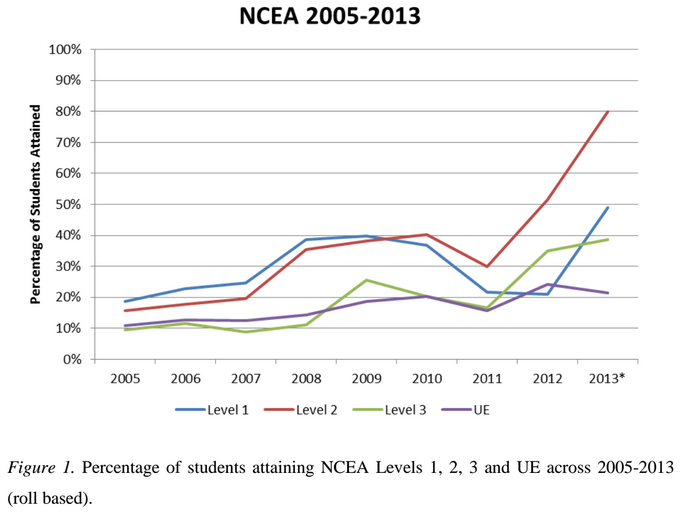 The graph shows a clear increase in academic results for NCEA Level 1, 2 and 3. A key message from the study is that having digital devices is not as important as how they are used to challenge thinking and create learning. Our teachers have been involved in a range of training programs over the last 3 years around the use of digital technologies in the classroom and the use of Google Apps in particular. We have gained a number of insights into how to best use these technologies and have made some very encouraging observations around student engagement.